This big aquamarine rose gold ring brings the glamour of the 1940s to you. 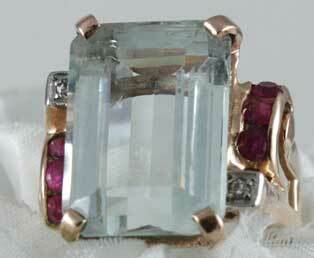 A large, appx 13.85 carat aquamarine holds center stage in this colorful ring. This big stone is centered between two colorful vertical rows of cherry red rubies with each row topped with a diamond. Enhancing this ring is a swirling 14kt rose gold mounting. Patriotic inspired jewelry was very popular after WWII ended. Popular jewelry motifs included red, white and blue jewelry and ribbon designs.